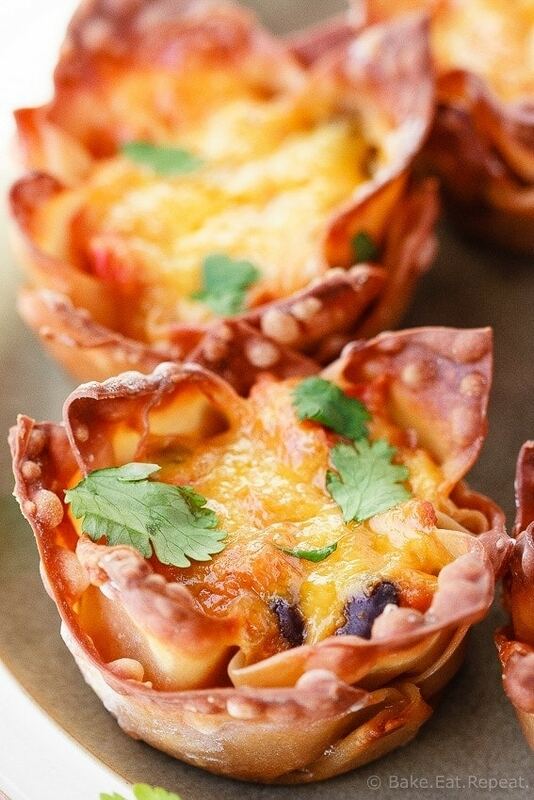 Crispy wonton cups filled with a black bean and sweet potato taco mix – these cute little taco cups are the perfect appetizer or meal! So….these weren’t supposed to be this. I don’t even think that’s a sentence. What I mean is that these cute little sweet potato taco cups are not what I started out making. I’m not sad it’s what I ended up with because I really enjoyed these things, but it wasn’t the original goal. The first thought I had was a sweet potato burrito of some sort, but my family doesn’t love burritos, or sweet potatoes, and I can’t eat a whole batch of them myself so I scrapped that. Then I thought stuffed sweet potatoes would be amazing. And I still think that. You could totally use this filling to make stuffed sweet potatoes and ditch the wonton cups if you wanted. That was the plan. The problem was the sweet potato skins. I’m clearly inept in the crispy potato skin department, because I could not make them work. From all the recipes I read, you’re supposed to bake them, then slice in half and scoop out the flesh, leaving a little behind to make the shell stand up, then bake again to make them crispy. Simple enough, right? Not so much. The skins just slid off when I sliced the baked sweet potatoes in half, so there was no leaving a little bit in them. So then when I tried to make them crispy they just collapsed into a flat pile on the baking sheet. Stuffing them was clearly not going to work for me. So, plan B. And you know what? Sometimes plan B is even better. 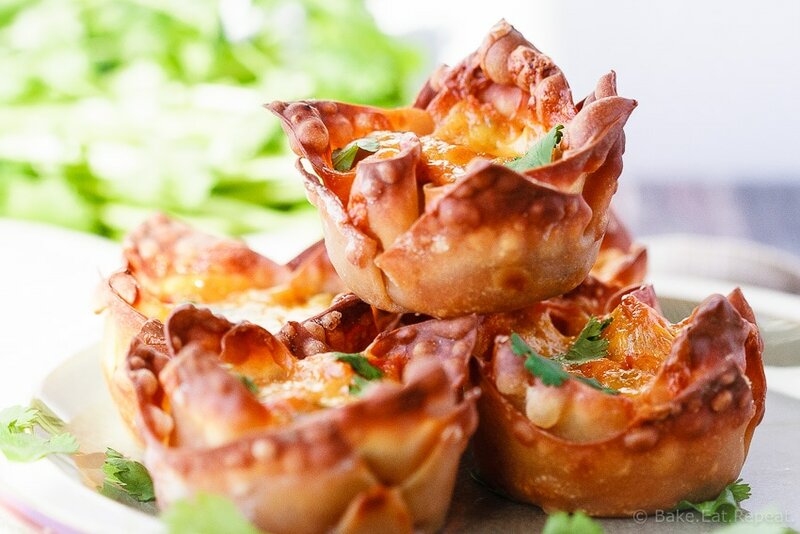 Using wonton wrappers to make crispy little cups to fill up with the sweet potato taco filling may have been even better then stuffing it into the potato skins. 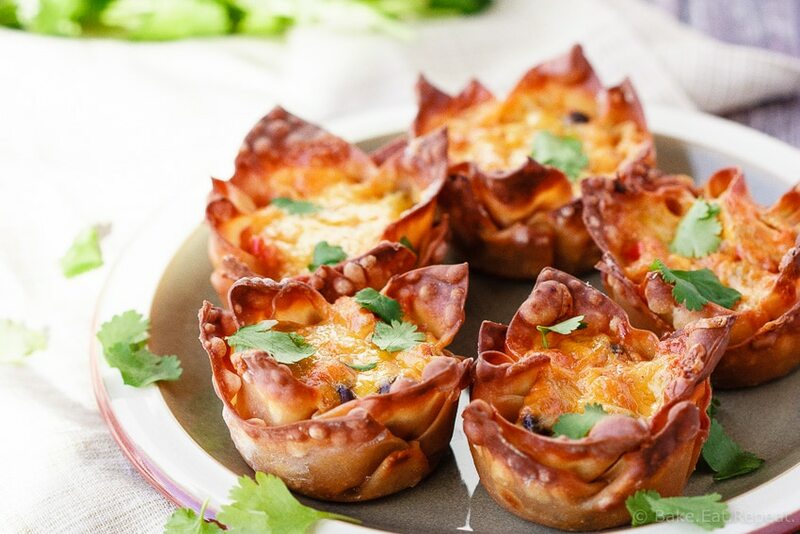 Crunchy wonton cups, creamy sweet potato and black bean taco filling, melty cheese, and plenty of salsa and sour cream for dipping – these were amazing. Of course, I didn’t even bother giving them to my family since none of them like sweet potato and black bean things, so you’ll have to take my word for it. But I did eat these sweet potato taco cups every day for a week for lunch, so you can probably trust me! Crispy wonton cups filled with a black bean and sweet potato taco mix - these cute little taco cups are the perfect appetizer or meal! Preheat the oven to 400 degrees F. Place the sweet potatoes on a parchment lined baking sheet and roast for 45-50 minutes, or until they are fork tender. Allow to cool for 5-10 minutes, or until you can handle them, and then slice them in half and scoop out the flesh. Mash the sweet potato flesh together with the yogurt. While the sweet potatoes are roasting, heat the olive oil in a frying pan over medium heat. Add the jalapeno, red pepper, red onion, garlic, chili powder, cumin, salt and pepper and saute until the vegetables are softened, about 3-4 minutes. Remove from the heat and stir in the black beans, cilantro and lime juice. Add the vegetable mixture to the mashed sweet potatoes and stir to combine. Increase the oven temperature to 425 degrees F. Lightly spray 2 muffin tins (24 cups) with cooking spray and press one wonton wrapper into each muffin cup, pressing it into the bottom and up the sides to form a cup. Spray the tops of the wonton wrappers with cooking spray. Place the muffin tin in the oven and bake for 10 minutes, or until the wrappers are crispy. Spoon the sweet potato filling into the wonton cups, about 2 tablespoons per cup. Top with shredded cheddar cheese. Bake for another 10-15 minutes until the cheese is melted and bubbly. Remove from the muffin tin and serve with salsa and sour cream. The wonton cups don’t stay super crispy in the fridge, so if you’re not eating these right away, just keep the sweet potato filling in the fridge until you’re ready to make the taco cups. I kept the filling in the fridge and then would make a few at a time, rather then the full batch of 24. I'm glad you kept on trying because these look delicious! The crispy shells look particularly yummy! I think Plan B is definitely better! These taco cups look amazing. these sound so delicious Stacey! I actually made sweet potato burrito bowl yesterday, can not get enough of it! Aww it's so funny when you start out when a clear recipe in mind and end up with something completely different! I can't tell you how many times that has happened to me! These look like a super delicious plan...C? LOL. I would gobble them right up! These taco cups look so good, Stacey! And so delicious! Aren't happy accidents like this the best? Sounds like this would make the perfect appetizer or dinner...love the sweet potatoes in here!